Hot Wheels has transformed the iconic X-Wing Fighter from Star Wars into a high-performance race car for San Diego's annual Comic-Con event. Dubbed the X-Wing Carship, the car was created by Hot Wheels designer Dmitriy Shakhmatov and built with the assistance of Action Vehicle Engineering which also made last year's Darth Vader car. While the model is based on a 1:64 scale model, Shakhmatov told Co.Create the small scale of the toy "eliminates certain elements of a car to make it more appealing to consumers, so there were lots of changes that needed to be made to the full-size car to make it look good and perform well." Details about the car are limited at this point but the model is reportedly powered by a Ford-sourced 2.0-liter four-cylinder engine that produces 175 horsepower. This enables the car to hit a top speed of 180 miles per hour and produce 950 pounds of downforce at 165 mph. 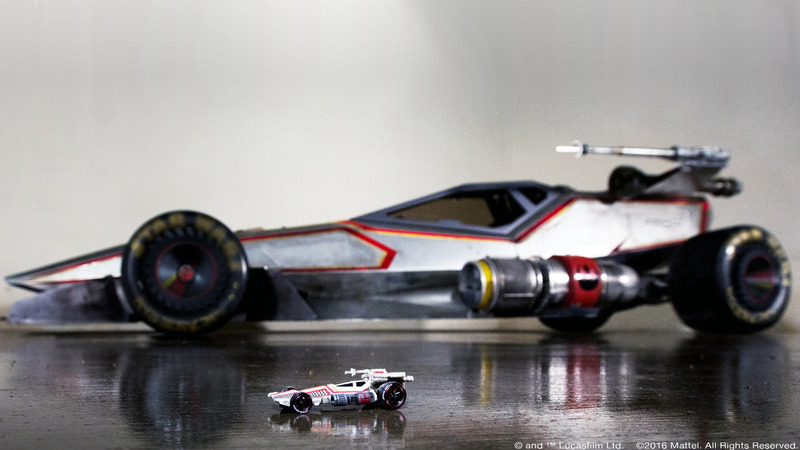 Hot Wheels also revealed the X-Wing Carship has AP dual piston calipers with slotted rotors as well as custom slick tires which enable the car to "out-maneuver the Empire and save the galaxy." An assortment of different 1:64 scale Carships will be available at retailers later this year but there's no word on what we can expect.